Beloved of God, called to be saints: Grace to you and peace from God our father, and the Lord Jesus Christ. I thank God for you all, and I apologize for not posting until now but one thing is sure I make mention of you always in my prayers. Please thank you so much for your understanding. I love you all!! Ask, and it shall be given you; seek, and ye shall find; knock and t shall be opened unto you. Lord we thank you for your word, for all you are going to do, the testimonies, deliverance, miracles, we thank you! May all glory be unto you forever and ever, Amen! In order to make your dreams come true, sometimes you will need assistance. You have to be willing to humble yourself and ask for help, sometimes the person that can assist you is not far away, in fact is within your grasp. You have to be positively desperate; some people may say desperation can lead one to do that which he or she may regret in life. That’s very correct but if you are desperate with the power and wisdom of God and your faith in Him is very strong, not minding what people may be saying to discourage you, then be sure that Him that that said Ask and it shall be given…, will meet you at the point of your desperate prayer, all you have to do is open up your spirit and hold Him with His Word, for He’s able! If you for one minute take a look closely at these scripture you will find an action command that relates o the benefit you will receive! You don’t just have to desperate for anything. You need to have a clear picture of what you want, if you don’t then that’s where confusion, frustration will set in and you can settle for anything that may lead you to regret for the rest of your life if god is not by your side! You need the wisdom of God to backup this desperation and that’s where prayer set in. It is true that with little or no praying you may experience popular, pleasant, captivating things in your life because sometimes time and chance may happened. Ecclesiastes 9:11 says I returned, and saw under the sun, that the race is not to the swift, nor the battle to the strong, neither yet bread to the wise, not yet riches to men of understanding, nor yet favour to men of skill; but time and chance happeneth to them all. When you see things happening in this way it simply mean that Grace has taken place. Grace is the help of God is the help of God on a man to do an extra ordinary exploits. Grace raises men. It makes a wonder out of an ordinary man. Today the Grace of God will raise you another level to do exploits in Jesus’ name, Amen! Apostle Paul testified of God’s grace in his life in 1Corinthians 15:9 For I am the least of the apostles, that am not meet to be called an apostle, because I persecuted the church of God. But by the grace of God I am what I am: and his grace which was bestowed upon me was not in vain; but I labored more abundantly than they all. Yet not I, but the grace of god which was with me. I declare the grace of God to locate you today in Jesus’ name, Amen! Success is not a function of how much effort you put in. it is not dependent on the amount of energy you dispense in trying to make a way for yourself; it is by the grace of God . It is written in Romans 9:16 S then it is not of him that willeth, nor of him that runneth, but of God that sheweth mercy. You do not pray desperate prayer when all is well with you, Modecai who sat at the gate saw Haman’s threat and with the kind of power the king gave to him, Haman would have stopped at nothing to destroy the Jews. So many of us are sitting at the gate even in our very home, place of work, relationships, business, career, education and ministry and we have done nothing about it. I charge you to desperately run to God in prayer. Seek His face. To succeed, you must seek God for his grace and help. The help of man can only take you as far as his limited ability. God’s ability and willingness to help you is limitless. The grace, mercy and help of God are our greatest asset in life for the release of exploits. I pray the Spirit of God locate you as you begin to seek his face desperately I prayer in Jesus’ name, Amen! You are destined for glory! Be connects to the word and remain blessed!!! Great Write-up. Apology accepted, Amen to all prayers. 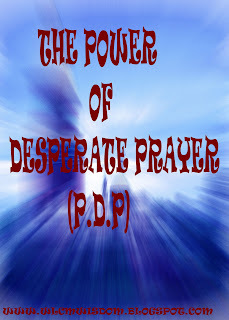 It is better to pray desperately now to avoid frustration tomorrow. *smiles* thank you so much foe accepting my apology. You said it well Tope, it is better to pray desperately now..and that's why our brother David said in Psalm 109:4...but i give myself unto prayer. I love your believe Pastor Gloria...for it is written in Isaiah 7:9 ...if ye will not believe, surely ye shall not be established. Amen! Missed you Lucy. The effectual fervent prayer of a righteous man availeth much. o yes Precious dear..you can say that again! Welcome back pastor..I havent been online lately as well. Our beloved Secretary, how are you doing? what my pastor preached in church today,wow! the spirit of God is one. his grace is what i ask for. Receive The Grace of God to do exploits in Jesus' name, Amen!! Our women's President, Stay blessed! Lucy, welcome. I have been wondering where you were hiding. Hahahahahaha...Ayandola dear...how are you doing???? So sorry I didn't even check on you while you were away. That's so bad of me. Anyway, it's good having you back here Lucy. Desperate prayers are what we Christians need at the moment to be able to overcome in this sinful and wicked world.